David Childress, popular author and star of the History Channel’s show Ancient Aliens, brings us the incredible story of the Cham: Egyptian-Hindu-Buddhist seafarers who ruled a realm that was as big as the Pacific Ocean. The mysterious Cham, or Champa, peoples of Southeast Asia formed a megalith-building, seagoing empire that extended into Indonesia, Fiji, Tonga, Micronesia, and beyond—a transoceanic power that reached Mexico, the American Southwest and South America. The Champa maintained many ports in what is today Vietnam, Cambodia, and Indonesia (particularly on the islands of Sulawesi, Sumatra and Java), and their ships plied the Indian Ocean and the Pacific, bringing Chinese, African and Indian traders to far off lands, including Olmec ports on the Pacific Coast of Central America. Statues in Vietnam of the Champa show men and women distinctly African in appearance and the Champa royalty were known to consist of nearly every racial group. They had iron tools and built megalithic cities of finely-cut basalt and granite, such as the city of My Son in central Vietnam. Its construction is identical to that at Tiwanaku in South America. Topics include: Who Were the Champa? ; Cham and Khem: The Egyptian Influence on Cham; The Search for Metals; Trans-Pacific Voyaging; The Basalt City of Nan Madol; Elephants and Buddhists in North America; The Cham and the Olmecs; The Cham in Colombia; The Cham and Lake Titicaca; Easter Island and the Cham; the Magical Technology of the Cham; tons more. 24-page color section. 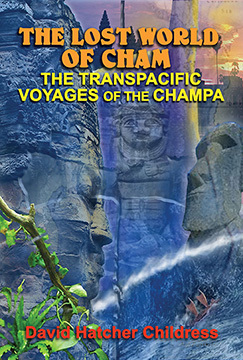 THE LOST WORLD OF CHAM: The Trans-Pacific Voyages of the Champa By David Hatcher Childress. 423 Pages. 6x9 Paperback. Illustrated. Color Section. Bibliography.